(Newser) – Andre Pittman and Gregory Cornes are on a mission to rid Washington of opportunistic vermin. But their target isn't corrupt officials or shady political fixers; it's Rattus Norvegicus, the common Norway Rat. The nation's capital is facing a spiraling rat infestation, fueled by mild winters and a human population boom. 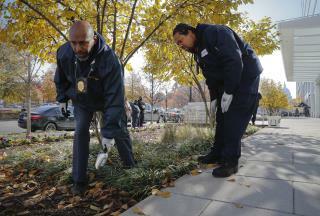 Washington's government is struggling to keep pace, with the pest control department fielding a record number of calls. On one recent day, Pittman and Cornes, both veteran Health Department employees, worked within sight of the Capitol, shoveling dry ice pellets into suspected rat burrow entrances. On another, they were dealing with an outbreak about six blocks north of the White House. "Rats adapt to everything. They can be like geniuses," Pittman says. and yet the people in all 4 cities still vote for more rats. Now THIS is a rhetorical headline lol! Yes...the rats are taking over DC...so remember to vote Democrat or Independent in 2020!